Jetsunma Ahkon Lhamo with Dudtsi, an Umbrella Cockatoo. Photo courtesy of Gardua Aviary of Sedona. Working with parrots, according to Ven. Konchog Norbu, is a training ground for equanimity and love. He tells the story of Garuda Aviary, a sanctuary in Sedona, Arizona (named after a mythical bird in Hindu and Buddhist culture), where nearly 40 of these long-lived, idiosyncratic creatures absorb the loving attention of a team of monks, nuns, and the lay community. 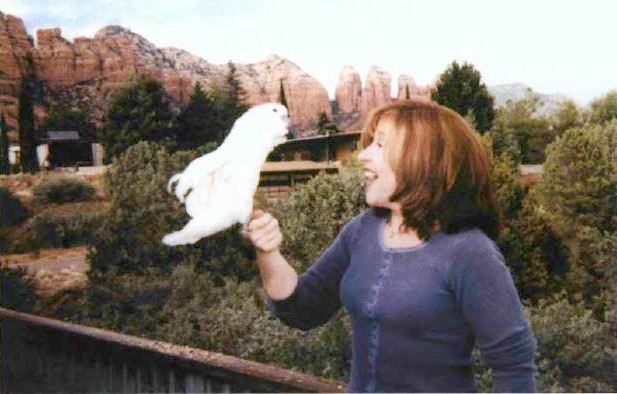 It is in this spirit that the contemporary Buddhist teacher Jetsunma Ahkon Lhamo, spiritual director of Kunzang Palyul Choling (KPC), founded Garuda Aviary to provide a lifelong sanctuary for abused and neglected companion birds. Situated on her property in northern Arizona, Garuda Aviary is now home to nearly 40 birds ranging from a tiny Sun Conures to a Hyacinth Macaw, the largest parrot in the world. Housed in a custom-converted garage with a large flight cage built off the back, the Aviary is now an official non-profit organization run by KPC’s monks and nuns, with volunteer help provided by the Buddhist and non-Buddhist communities.